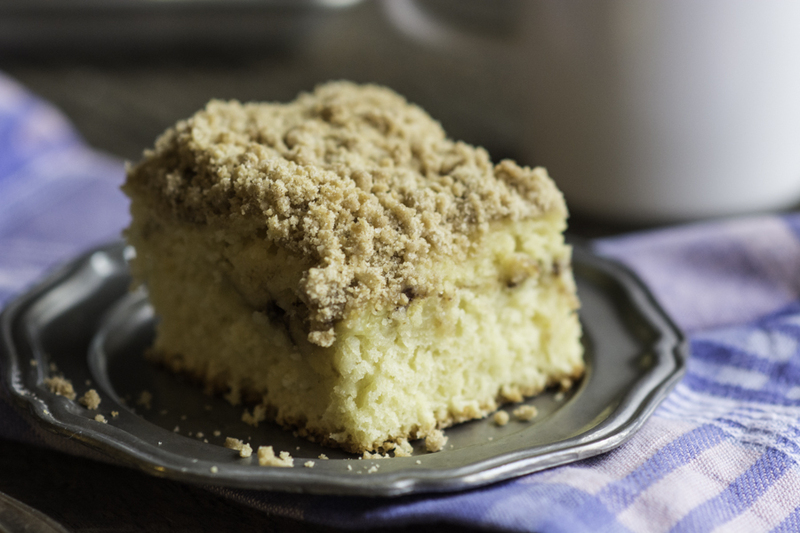 Is there anything better on a lazy wintery Sunday morning than hot moist coffee cake right from the oven? I didn’t think so! 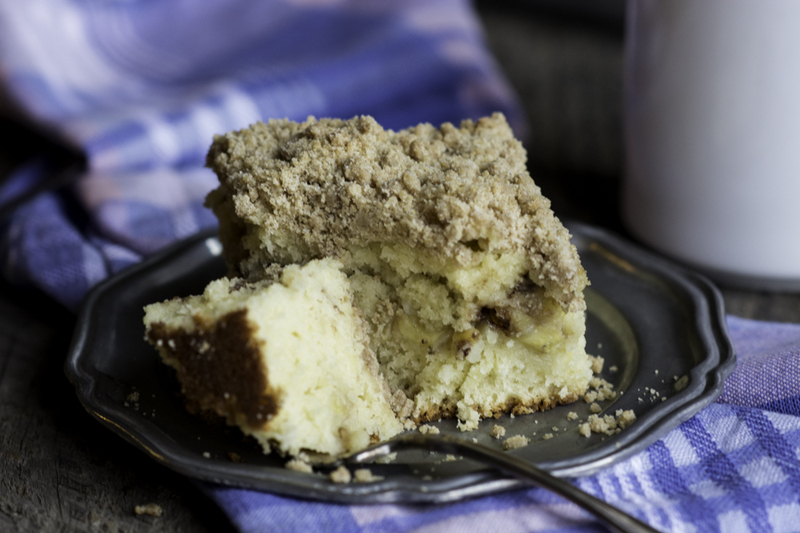 Maybe if you add a layer of bananas and Nutella in the middle of your coffee cake…. My daughter says Nutella is the bomb! This recipe is inspired from a present I received on Christmas. A cookbook by the name of Ovenly. They are a bakery over on the East coast in NY. I have not been yet, but it is on my bucket list! 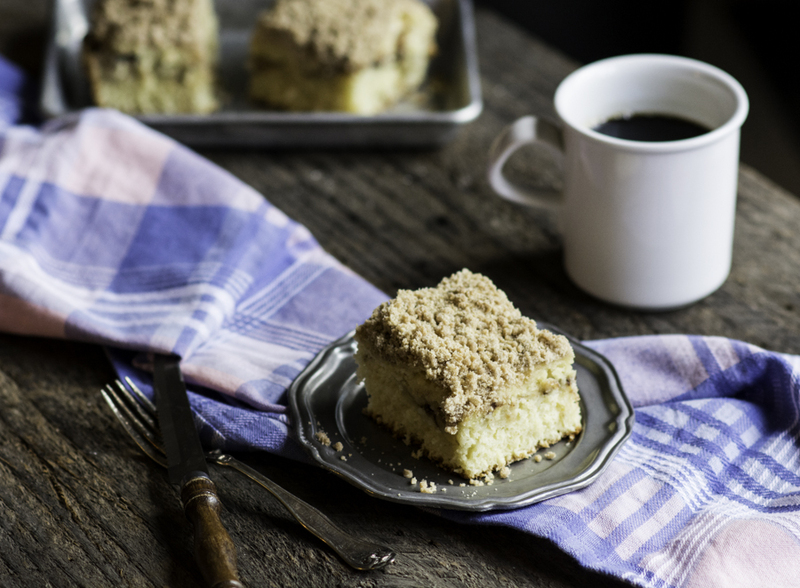 I’m also a sucker for a great piece of coffee cake. It has to be moist and flavourful, with a hint of tang from the buttermilk and loaded with cinnamon sugary crumbly topping. That’s the perfect coffee cake in my opinion. The addition of bananas and Nutella are a huge bonus, like the icing on a cake, or the sprinkles and cherry on a sundae! Sunday mornings in winter are my breakfast/baking mornings. It’s the one day of the week when we actually can lounge around in our PJs and just be still for awhile. We are Monday – Friday working folks that start our days at 4:30am, hit the gym before work, and end the day around 6 or so. Saturday mornings are either at the gym in Spin class or outside on our road bikes. So we cherish our downtime come Sunday morning. This coffee cake is one of the best I’ve made so far. It’s moist, tall, lots of flavour, and lots of topping. The buttermilk and sour cream give the cake it’s moistness with a bit of tang. The Nutella and bananas give a sweet touch and surprise layer in the middle. It taste soooooo good warm right out of the oven. I also think it’s best the day it’s baked, on the 3rd day it is a bit dry, that is if you even have any leftovers! The ladies over at Ovenly are genius with this recipe. I’ve decided it’s a good thing I live on the West coast or I would be at their bakery like every morning! Then I would have to hit the gym twice a day to burn all those calories, yikes! 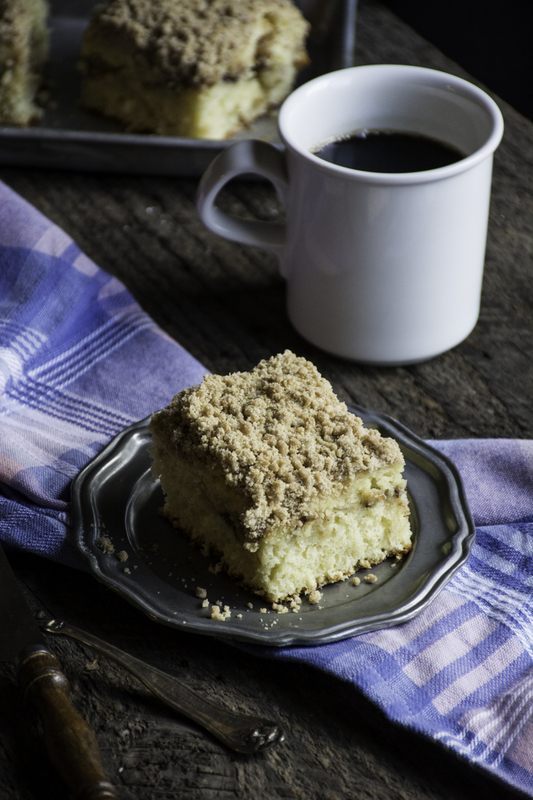 On your next Sunday morning, lounge in your PJ’s for an extra hour or so, cuddle up with your loved one, and enjoy this coffee cake with your favorite cup of joe or tea and enjoy being in the now. The laundry can wait, the dishes can wait… you deserve some down time! Melt the 1 C of butter and set aside. In a separate bowl, whisk together the buttermilk, eggs, sour cream, vanilla, and melted butter. Layer half the batter into the pan, lay the sliced bananas on top and drizzle the nutella spread. You may need to warm the spread to make it thin and pourable. Next, carefully layer the remaining batter on top of the bananas and nutella. I used a spatula to smooth out the batter, it is thick batter. Melt 4 Tbsp of butter and set aside to cool. Whisk remaining dry ingredients in a small bowl. Add the melted butter with your hands or a folk and mix until crumbly. Sprinkle topping over coffee cake batter. Cool on a wore rack before slicing. Looks like a delicious start to the morning! YUM! That looks like a beautiful book–a creative bakery indeed! I bet the chocolate + banana combo is good. I don’t eat grains or carb-heavy foods before about 5pm, but I might try homemade nutella and banana slices on ice cream sometime post-workout! Has anyone tried assembling this the night before to bake the next morning?